You wedding day is surely the most essential day of your life, but it is also the most hectic phase in your life that can ruin your wedding day memories if not handled properly.Arranging your wedding whether two years or two months ahead of time, in both the cases it is very chaotic and thus can be upsetting.Wedding planning is not an easy task. It requires precision, and patience. Huge number of responsibilities needs to be performed to bring about a successful and memorable wedding ceremony.In the event that you are finding it difficult to manage everything, you should know that you need something called Wedding Planning Vacation Checklist Templates. This agenda is a general commencement of all the primary things you have to do. 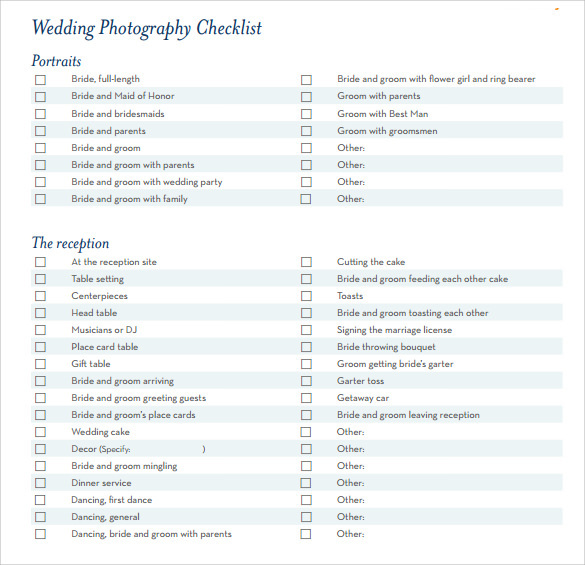 A wedding photography checklist template is an interesting template. 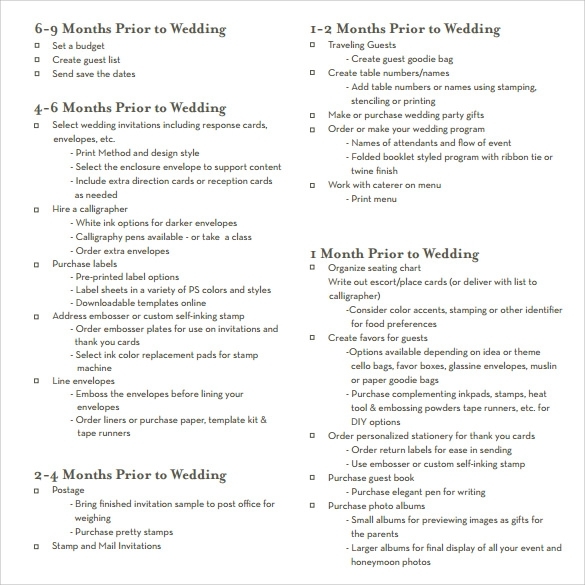 This template contains the specific item list of things that might be needed for photography department during the wedding process. This is because a photo shoot is an indispensable part of a wedding event, thus this template can be helpful for creating a checklist specifically for photography purpose. This template is available for free use as well. A complete wedding planning checklist template is another interesting template describing the list of things you must be doing for a flawless wedding event. 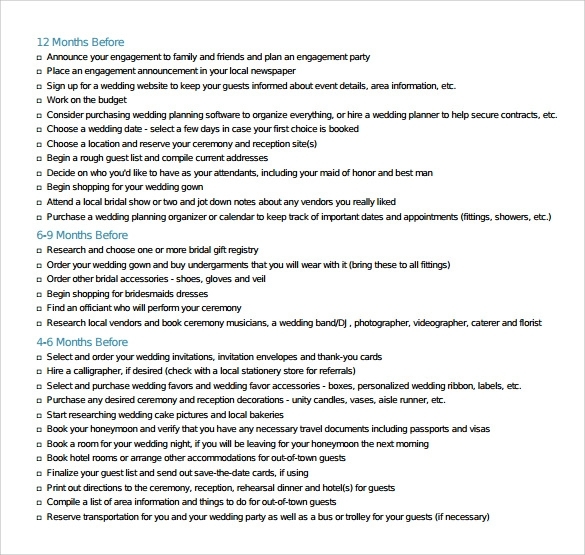 This template like the previous one also lists the number of things you ought to be doing 12 months before the wedding, 6 months before the wedding, 4 month before the wedding, and so on. Download the free checklist online in PDF Format for free use. A wedding planning checklist template is a comprehensive document that contains all the necessary item/things/services that might be needed by one for the event but one may/may not be able to remember all of them. So this self-sufficient template can help one in creating such a list. This template is a free to avail template that can be downloaded in PDF Format. 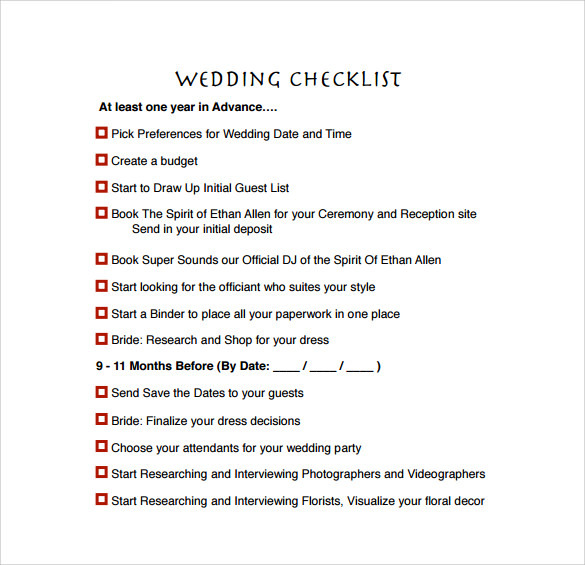 A wedding preparation checklist template is another well-designed template that can be used by you for creating a checklist of wedding items/events. Starting from 8-12 months before the wedding, the preparation of this event begins so the template takes care of that and highlights all the things that must be necessary for the quarter before the wedding. Download the template to unload yourself of some burden. Why do we Need a Wedding Planning Checklist Template? Wedding planning checklist templates are mostly used by wedding organisers who needs to maintain a diary of the wedding event. And they need to be very organised and systematic in taking care of the things, tasks and activities that have to be done before the wedding, more precisely 12 months before the main event. They thus can seek help from these wedding planning templates to avail a beautiful template that solves their purposes well. Wedding planning templates are very helpful for them. When do we Need a Wedding Planning Checklist Template? Along with the planners, the to-be-wedded couple may be planning their wedding by themselves. For them, these templates can be a boon. They can take ideas from these templates in order to have a speckles, sheen event i.e. their wedding. A clear cut schedule before the wedding helps one avoid lapses or confusions, in fact if you begin 8-10 months before the event that means you would still have time in case anything goes wrong- the dress, the food, etc. The list of wedding checklists mentioned here contains different types of checklists varying in the organisation of the event as well as degree of the planning. So one can choose the template that suits one the best.You can also see Sample Vacation Checklists Templates. 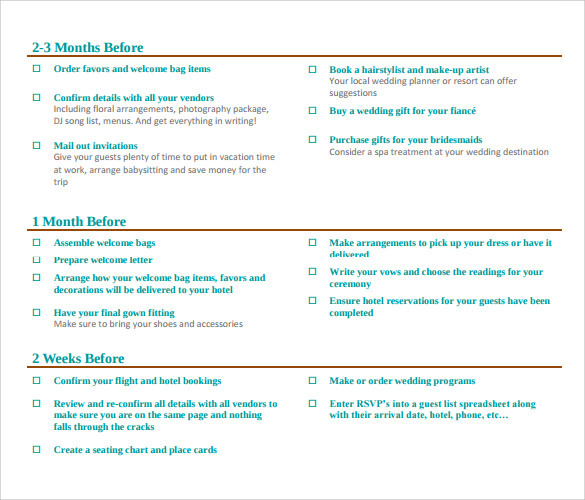 What are Benefits of Wedding Planning Checklist Templates? 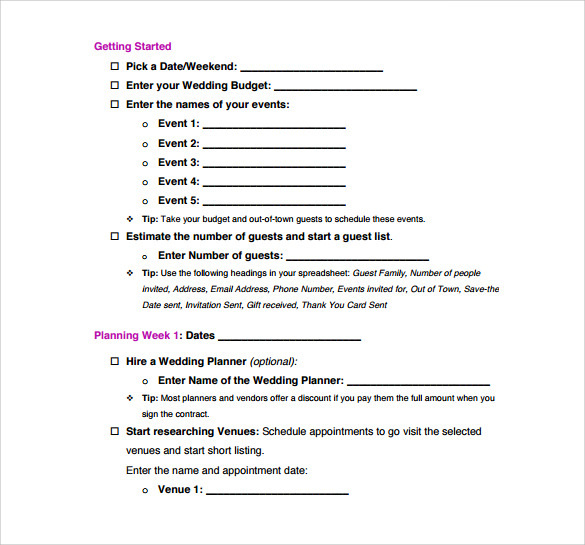 There are many benefits of wedding checklist templates one, they help you to successfully organise a big event. And two, they demand less labour from you. All you need to do is fill in the checklist and also take ideas from the checklist in case you miss out some items from the checklist. The templates are also, free for downloads so the user can avail them without registering anywhere or paying any costs. Most of the templates are fool-proof plans for you. 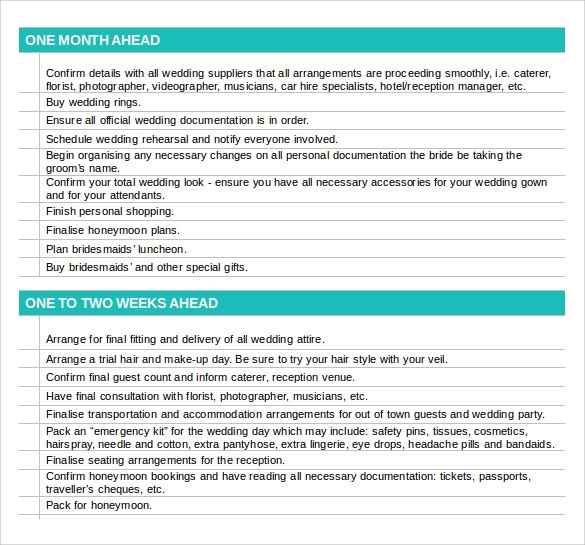 Download the free wedding planning checklist templates to avail the best of both worlds i.e. both organised format and no undue labour. So one can download them at one place and choose the template that suits us the best. If you further want to lessen your headache then visit our page for Sample Wedding Planning Checklist Template. Our fab wedding agenda posts will offer you some assistance with getting composed and arrange both your time and your financial plan adequately. To ensure that everything goes as indicated by timetable and is immaculate, as you might want it you need to follow the checklist. On your wedding day there are considerable measures of things you can’t control, but with our Sample Wedding Planning Checklist Template it would at least be less demanding to deal with the issue.You can also see Sample Daily Checklists Templates.